This project is a conceptual outgrowth of >16 years of research by PIs Henkel, Aime, and colleagues on the EM fungi associated with the EM tree genus Dicymbe (Fabaceae subfam. Detarioideae), which forms monodominant forests in South America’s Guiana Shield region. Expanding this research to the Guineo-Congolian rainforest of Central Africa is the logical next step in part because Dicymbe is closely related to tropical African detarioid EM tree genera including Gilbertiodendron, which also form monodominant forests (Peh et al. 2011a; Smith et al. 2011; Fig. 1). 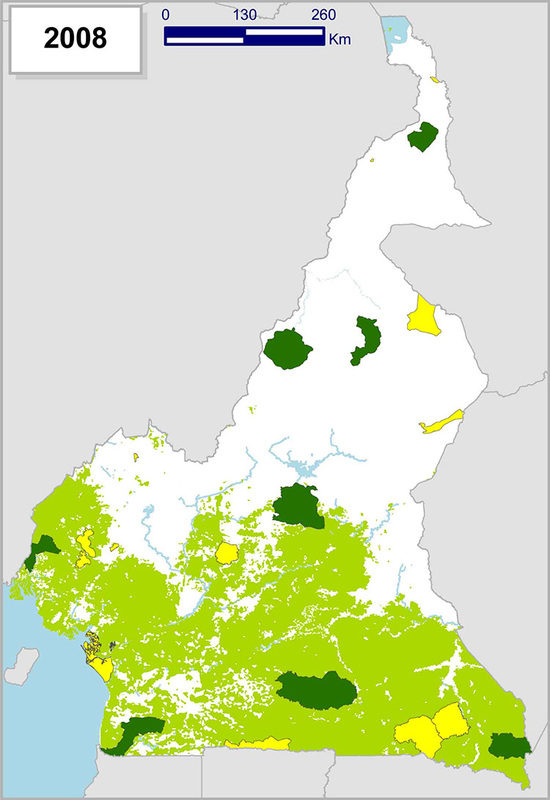 The primary research site is the Dja Biosphere Reserve, a protected area of nearly 600,000 ha in south-central Cameroon (Fig. 2). The Dja is characterized by lowland tropical rainforest of the Guineo-Congolian type (Mbolo, 2004; Sonke, 2004) and features extensive monodominant stands of Gilbertiodendron dewevrei (De Wild.) Leon, a large EM caesalpinioid canopy tree (Kouob 2009; Letouzey 1985). In addition to Gilbertiodendron forests, the Dja Reserve also features forests with mixed species assemblages of other EM caesalpinioids along with EM Uapaca spp. (Phyllanthaceae). A second research site is proposed in Korup National Park, a protected area of ~127,000 ha in southwestern Cameroon . The primary forests of Korup are rich in EM Caesalpinioideae (Newbery et al. 2013). In particular, co-dominant stands of EM canopy tree species in the caesalpinioid genera Microberlinia and Tetraberlinia are well-characterized ecologically (e.g. Norghauer & Newbery 2011; Newbery et al. 2004; Newbery & Gartlan 1996) but remain poorly characterized for their EM fungi (Tedersoo et al. 2011; Roberts 2000, 1999; Buyck et al. 1996; Watling 1993). The Dja Reserve provides one of the largest remaining blocks of primary Guineo-Congolian lowland rainforest (Mbolo 2004), yet is accessible from the capital city of Yaounde; this dimension is critical because repeated, extended field seasons over several years are ongoing to achieve robust inventories of EM fungi. EM host plants occur in various forest types and densities at sites across the Dja. In Korup National Park, the presence of the ecologically well-studied EM detarioid co-dominant groves. These sites represent refugia of African tropical rainforest during the last glacial maximum (Maley 1996), and may be historical reservoirs of regional biodiversity, including fungi. Fieldwork at all sites entails access by 4×4 vehicle, hiking and portering, and establishment of base camp lab facilities. This approach is necessary given the remote nature of the field sites, but has proven effective for many previous studies of fungal systematics and ecology by PIs Henkel and Aime in remote areas of Guyana. Buyck B, Thoen D, Watling, R. 1996. Ectomycorrhizal fungi of the Guinea-Congo region. Proceedings of the Royal Society of Edinburgh, B 104: 313–333. Kouob S. 2009. Organization de la diversite vegetal dans le forets matures de terra ferme de sud-est Cameroun. PhD dissertation, Universite Libre de Bruxelles. 195 pp. Letouzey R. 1985. Notice de la carte phytogéographique du Cameroun au 1/500000. Domaine de la forêt dense toujours verte. Institut de Carte Internationale de Végétation, Toulouse. Maley J. 1996. The African rain forest – main characteristics of changes in vegetation and climate from the Upper Cretaceous to the Quaternary. Proceedings of the Royal Society of Edinburgh, Section B, Biological Sciences 104: 31–73. Mbolo M. 2004. Typologie et cartographie de la végétation de la Réserve de Biosphère du Dja. PhD dissertation, University of Yaounde, Cameroon. 125 pp. Newbery DM, Gartlan JS. 1996. Structural analysis of the rainforest at Korup and Douala Edea, Cameroon. Proceedings of the Royal Society of Edinburgh, B 104: 177–224. Newbery DM, Burgt, XM van der, Moravie, M-A. 2004. Structure and inferred dynamics of a large grove of Microberlinia bisulcata trees in central African rain forest: the possible role of periods of multiple disturbance events. Journal of Tropical Ecology 20: 131–143. Newbery DM, Burgt XM van der, Worbes M, Chuyong GB. 2013. 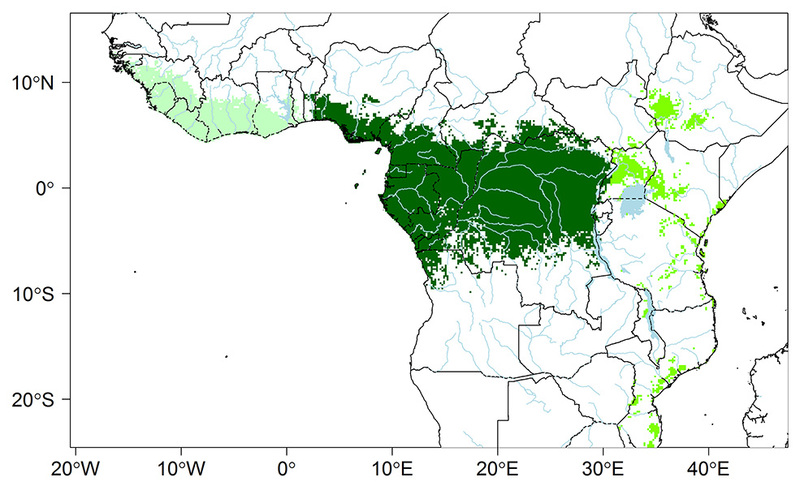 Transient dominance in a central African rain forest. Ecological Monographs 83: 339–382. Norghauer JM, Newbery DM. 2011. Seed fate and seedling dynamics after masting in two African rain forest trees. Ecological Monographs 81: 443–469. Peh KSH, Lewis SL, Lloyd J. 2011a. Mechanisms of monodominance in diverse tropical tree-dominated systems. Journal of Ecology 99: 891–898. Roberts P. 1999. Clavarioid fungi from Korup National Park, Cameroon. Kew Bulletin 54: 517–539. Roberts P. 2000. Corticioid fungi from Korup National Park, Cameroon. Kew Bulletin 55: 803–842. Smith ME, Henkel TW, Aime MC, Fremier AK, Vilgalys R. 2011. Ectomycorrhizal fungal diversity and community structure on three co-occurring leguminous canopy tree species in a Neotropical rainforest. New Phytologist 192: 699–712. Sonke B. 2004. Etudes floristiques et structurales des forets de la reserve de faune du Dja (Cameroun). Ph.D. thesis. Brussels: Universite Libre de Bruxelles. 266 pp. Tedersoo L, Bahram M, Jairus T, Bechem E, Chinoya S, Mpumba R, Leal M, Radrianjohany E, Razafimandimbison S, Sadam A, Naadel T, Kjoljalg U. 2011. Spatial structure and the effects of host and soil environments on communities of ectomycorrhizal fungi in wooded savannas and rain forests of Continental Africa and Madagascar. Molecular Ecology 20: 3071–3080. Watling R. 1993. Comparison of macromycete biotas in selected tropical areas of Africa and Australia. In: Isaac S, Frankland JC, Watling R, Whalley AJS (eds). Aspects of Tropical Mycology. Cambridge University Press, Cambridge, UK. 171–191.